The Vernon and District Performing Arts Centre Society proudly presents I Am Woman, Hear Me Laff 14 on Saturday March 10 at 8:00pm at the Vernon and District Performing Arts Centre. This special presentation is one of Vernon’s biggest stand-up comedy events of the year! Headlining our 14th annual I Am Woman, Hear Me Laff is Comedian Debra DiGiovanni. She’s been called the “Best Comedian to see after a Messy Break Up”, with a sharp edge, rapid-fire delivery, and playful air. A regular at comedy festivals and clubs across the country, DiGiovanni is a 4-time Canadian Comedy Award winner, and was Canada’s favourite female comedian for three years running. DiGiovanni has appeared on several comedy shows including ‘Gotham Live’ in New York City, ‘Stand Up in Stilettos’ in Los Angeles, and ‘Stand and Deliver’ for NuvoTV. She’s become a household name from her frequent appearances on CBC radio’s ‘Debaters’, as well as the Much Music show ‘Video on Trial’. DiGiovanni was a finalist on the 5th season of the hit NBC show ‘Last Comic Standing’, and a favourite on Montreal Just for Laughs Comedy Festival, having attended 10 times. You can see DiGiovanni in her independent film Unlucky, her stand up DVD “Single, Awkward Female” (which is now playing on Netflix), and as a panelist on the comedy network’s revival of Match Game. She’s even picked up a Gemini Award (a Canadian Cinema and Television award) for best-televised comedy performance in 2010. Originally from Tillsonburg, Ontario, DiGiovanni now lives in Los Angeles, California. This evening will be Emceed by Jan Bannister, with opening acts Alison Ogilvie and Nic Enright Morin. Celebrate International Women’s Day with us and some of the funniest women in comedy! 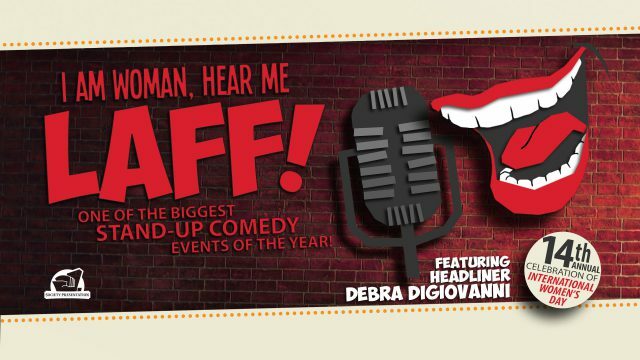 Tickets for I Am Woman, Hear Me Laff 14 Featuring Headliner Debra DiGiovanni are $35 for adults, $32 for Seniors and $30 for Students. Call the Ticket Seller at 250-549-SHOW (7469) or log on line to www.ticketseller.ca for tickets and more information.